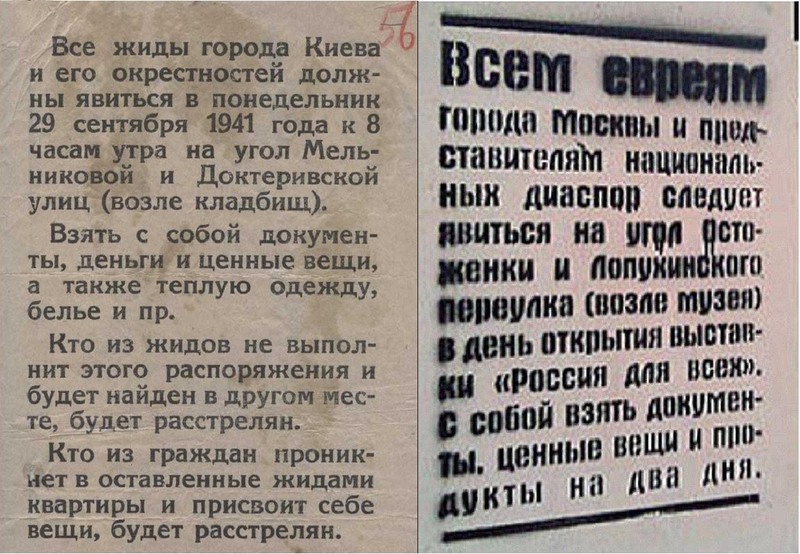 All the Jews (жид) of the city of Kiev and its environs must appear on 29 September 1941, Monday at the corner of Melnikova and Dokterivskaya streets (next to the cemetery). They must bring with them their documents, money and valuables, warm clothes, underwear, etc. Any Jew who does not comply with this instruction and will be found elsewhere, will be shot dead. Any citizen penetrating into the abandoned Jewish flats and taking away the things left there, will be shot dead. All the Jews (еврей) of the city of Moscow and the representatives of the ethnic diasporas must appear at the corner of the Ostozhenka and Lopuhinsky pereulok (next to the museum) on the day of opening of the exhibition “Russia is for everyone”. They must bring with them their documents, valuables, and food for two days. The announcement to the left side appeared on the walls of Kiev on 21 September 1941, two days after the German occupation of the city. On the fate of the almost thirty-four thousand Jewish citizens who gathered on the indicated day and were executed during 29 and 30 September in the Baby Yar ravine in the outskirts, we have already written, also presenting the photos by Johannes Hähle made on the day following the massacre. 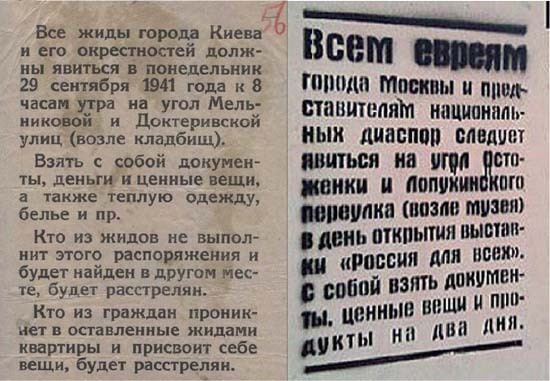 The announcement to the right appeared on the walls of Moscow some days after the 70th anniversary of the massacre of Baby Yar and on the day of the holiest Jewish feast, Yom Kippur, that is the day before yesterday, 8 October. The exhibition mentioned in it already opened on 25 August, so the choice of the date is probably not a coincidence. The walls of the exhibition Россия для всех – “Russia is for everyone” are all covered by the paper graffitis by the contemporary Russian artists Viktor Bondarenko and Dmitry Gutov. Each paper shows a great name of Russian history and culture, and underneath the non-Russian ethnicity of one or both of his parents, from the Finno-Ugric, Osetian and Polovets fathers and mothers of medieval princes to the representatives of Armenian, Tatar or German origin of contemporary Russian culture. 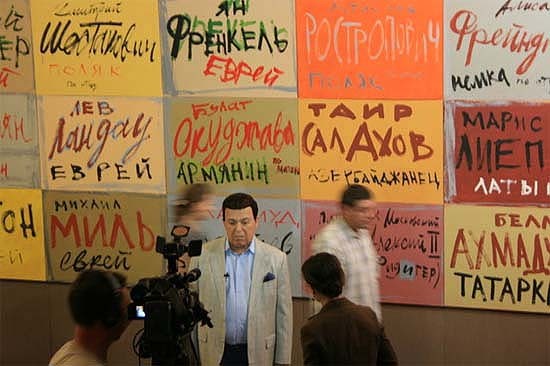 According to the declaration of the artists, the exhibition aims to present, in the atmosphere of growing ethnic tensions and in face of the ideal of a “pure” Russia, the image of the Russian culture made great by the contribution of many ethnic groups, which Russia can be proud of. According to the opponents of the exhibition, it puts the emphasis on a quite different place, and claims that Russia can be proud only of these creators, while the Russians did not make any significant contribution to what is really valuable in the culture of Russia; and at the same time it conceals the fact that the average inhabitants of Moscow perceive as the true cause of ethnic tensions: that the various forms of urban criminality can be linked primarily to national minorities, especially to the first-generation immigrants from the Caucasus and Central Asia. It appears that history is very well known and skilfully used as a weapon by all parties. They only do not seem to have learned from it. I'm coming to the end of Chandler's translation of 'Life and Fate' by Vasily Grossman (recently dramatised over 8 hours by the BBC Radio 4 and available for download). Your posts hit harder for that.